The Warner Bros. 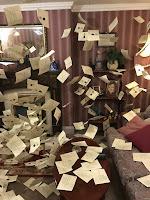 Studio Tour London is home to the sets and props of the beloved Harry Potter movies. Themed tours are becoming ever more popular, Hogwarts In The Snow alongside the extremely rare Valentines and Christmas Dinner visits. On Sunday 12th February 2017, my sister Becky and I attended Valentines Dinner in the Great Hall. 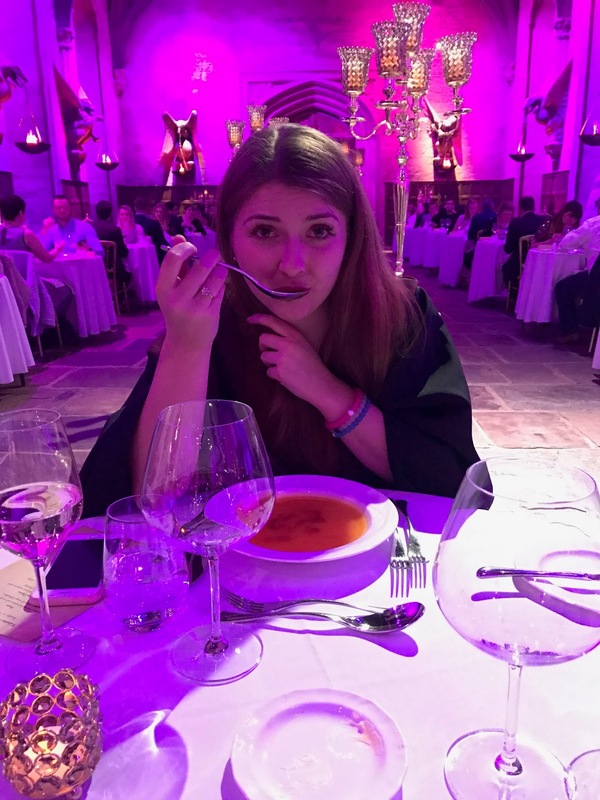 Becky entered a competition online, in which names where pulled at random, for a couple to attend Hogwarts around Valentines Day for a meal of a lifetime, and somehow, luck fell into our court, and we were one of the few lucky enough to land tickets! 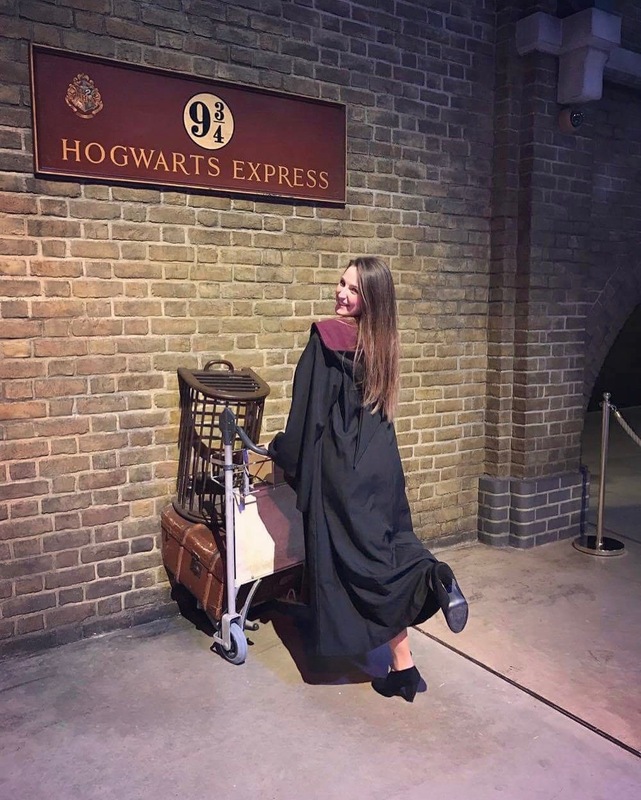 Being a huge Harry Potter enthusiast (nerd) I was so incredibly excited! We set off to Leavesden Studios, robes and all. Becky and I went in little red dresses (fitting with the theme) and our Gryffindor robes, and heels (not the best idea walking on a cobbled Diagon Alley). Arriving at 7pm, we were served drinks and canapés until 8pm. Our particular favourite drink was The Love Potion, which was Cranberry with Vodka and Peach Snaps, and was sort of steaming, like a real potion! It was very impressive looking... and went down a treat! We were given a briefing on how Harry Potter spread across the globe and highlighted the international fame the series has received. Then we sat down for a short film about the making of HP. And then the magic started. Our romantic, sisterly, Valentines Dinner was about to begin. The Great Hall looked amazing. Dazed in a romantic, soft pink lighting, three rows of little round tables were spread down the hall, each flickering with little LED tea lights (health and safety, children). Walking down the hall looking for our assigned tables (much like finding your seat in an exam hall, very nerve wracking) it was all very surreal. 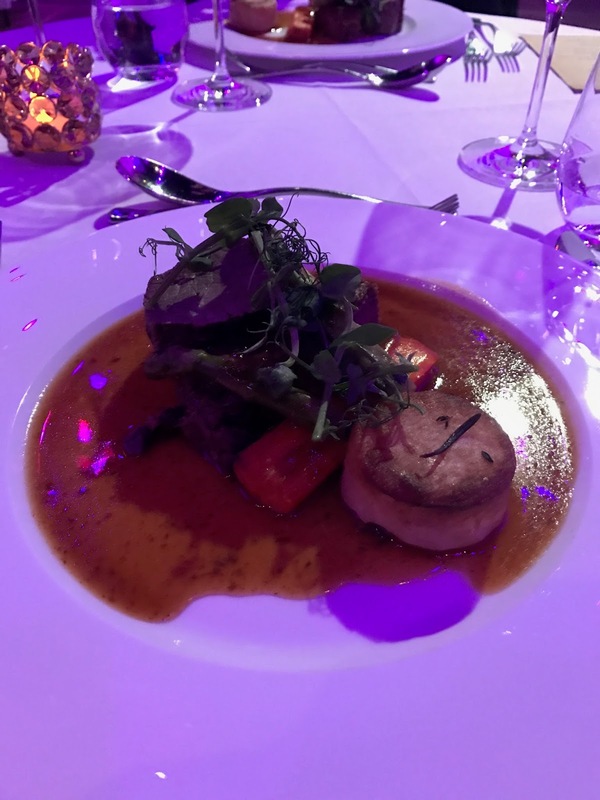 We found our table, in the middle row, roughly in the centre of the hall, in line with the fire place, we plopped down and first things first... grabbed the menu. Up until this point, we had no idea what we were in for, the food was a complete surprise... to us anyway, I don't know if there was any way to find the menu prior to sitting down in front of it in the Great Hall. And much to our horror, the first thing on the menu was lobster... we looked at each other, back at the menu and we were beginning to think we were going to have to starve as neither of us eat fish food... however, the vegetarian option was delicious! Butternut squash soup was served instead and smiles were all round. Of course, dinner was also served with wine! Much to our disgust, the trio of desserts was to share, and not a one each thing. But we managed after much fussing about cutting them in exact halves. 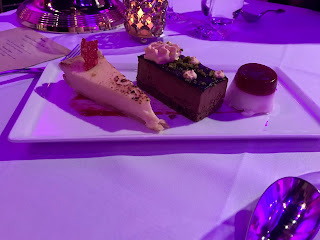 The lemon tart was delicious, and for the first time ever, I actually preferred it over the chocolate dessert! But the food was wonderful! Once all the food was consumed, we wandered around The Great Hall, looking at all the costumes and props. I, with my left over glass of wine in hand, could not have been happier. We moved onto the rest of the tour. We have visited a couple of times before, but yet every time we go, it is always slightly different. This time around however, they had Deatheater prowling the tour, who would lurk behind you, or stare at you, making you feel extremely uncomfortable! However, the were always up for a photo... they're more friendly than JK had us think! I had never seen it so empty, so we took this opportunity to take loads of photos and to also take a lot of film, without having tourists wander in and out of shots, and without that awful English feeling that you're holding up other people. We took our time wandering through the sets, then moved on to Platform 9 3/4. Here, they were serving more Love Potion, and with our inclusive voucher, we managed to scoop up the last two! We took a stroll through the Platform shop, decided to buy things at the end of the Tour to save carrying them. 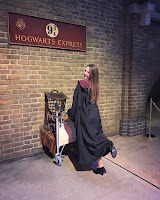 We then hopped on the Hogwarts Express, and took our time looking into each carriage, and getting the in true spirit of Harry Potter, as if the Great Hall hadn't been enough! Butterbeer was our next pit stop, Becky got a Mug of Butterbeer, and I overindulged on a Butterbeer ice cream, which she did have to help me finish! Having troughed as much as we could, we walked into Privite Drive! Which had not long been open. 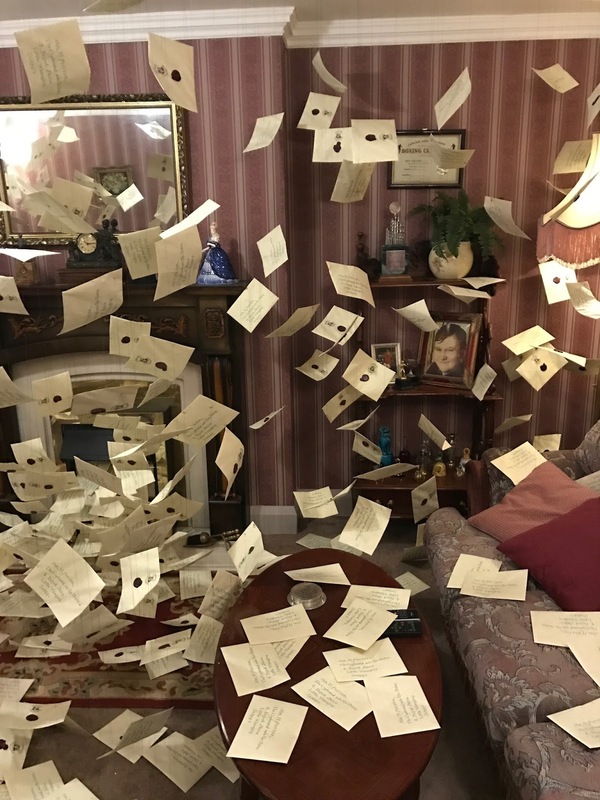 Walking through the Dursleys' front door was something I never ever thought I would get the chance to do, but there I was, strolling through the open door as if it were my own. After the shock of just how many letters were filling the living room, we continued onto the Magical Creatures Department. I always find the attention to detail, when it comes to the magical creatures incredible. Detail that is hardly even acknowledged onscreen. We slowly began to come to the end of out tour, through Diagon Alley, then past the most breath taking sculpture I think any human will ever see... Hogwarts itself. We ob-viously spent a while in the gift shop, picking out a little souvenir each. Then collected out goodie bags, that held our chosen wands! We walked out the doors just as they announced closing at 12am. The excitement was over, but the memories will stay with us forever... we have no excuse really with the amount of video footage we took! And I am so grateful to have been able to go with my best friend and little sissy.